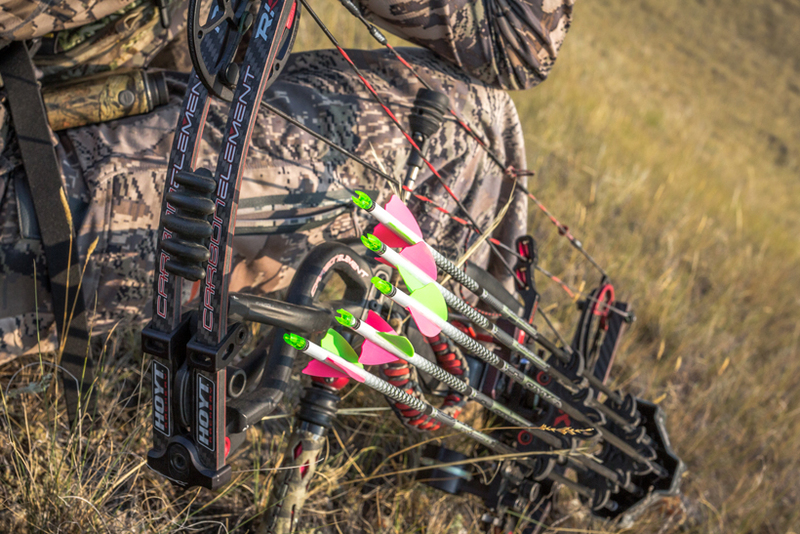 Selecting arrows for the next hunting season can seem like a daunting task. Proper arrows are extremely important if you want correct arrow flight, especially when shooting broadheads. Bowhunters like to spend a lot of money on the newest bows, sights and rests, but then buy cheap arrows from a store or pro shop. Contrary to popular belief, there is always a perfect arrow out there for your setup. Having the correct combination of spine, diameter, straightness and weight can get you there. Since there are so many variables involved, it is difficult to say that one arrow is perfect for all bowhunters. Arrows are determined by your body type, and the kind animals that you are pursuing. Carbon: these arrows dominate the market these days and for good reason. Carbon arrow are lighter, faster, penetrate better due to smaller diameter and carbon doesn’t bend like aluminum. Aluminum: these arrows are a great option if you are not concerned with speed and want a heavier arrow. Aluminum arrows are quieter out of the bow and allow a wider range of spine choices. Aluminum/Carbon: these arrows combine the best qualities of carbon and aluminum, and combine them into one. These arrows are extremely durable and the small diameter and thick wall of carbon in the middle provides consistent arrow flight, spine, straightness and increased penetration. If you shoot an arrow that isn’t spined correctly, it would be similar to shooting a banana out of your bow. The arrow will flex mid-flight and will cause inconsistencies downrange. This is one of (if not the most) important aspects of selecting a hunting arrow. The spine is a measurement of the arrow’s stiffness, in most cases the lower the recorded number on the arrow, the stiffer the spine. I always choose my arrows after taking static and dynamic spine into consideration. Dynamic spine is the way an arrow reacts from the stored energy as the bow is shot. This takes into account all of the unlimited variables and components of an arrow, broadhead design, fletching weight, additional arrow wraps, insert weight and bow speed. You can further manipulate the dynamic spine of an arrow and make it stiffer by shortening the arrow, decreasing bow weight, point/insert weight combinations, or adding weight to the back of the arrow. To determine the correct spine, you can check out the static spine chart below. This chart is based on a 100 gr. point. If you use a 125 gr. point, you may need to use a stiffer spine. If you use a 85 gr. point you may need to use a weaker spine. As draw weight increases, so should arrow spine. Draw weight lb. 25" 26" 27" 28" 29" 30" 31" 32"
The diameter of a hunting arrow is another big component of arrow selection. Should you select a mid-sized arrow or go with an ultra micro-diameter arrow? Personally, I made the switch to micro-diameter shafts a few years ago for hunting and I will never switch back. Small-diameter shafts enable increased penetration due to less surface area and friction behind the broadhead. This enables your arrow to maintain momentum for a longer period of time. The reduced surface area of an arrow smaller in diameter also reduces the amount of drift your arrow will see on a windy day. Since most micro-diameter shafts are lighter, they allow you to use more weight up front to improve flight characteristics and long-range accuracy. They still enable you to maintain kinetic energy due to increased wall thickness. One of the most critical points to consider with any arrow is straightness. I never cut my chances on accuracy by purchasing an arrow shaft of lesser quality. This is even more important nowadays because of the increase in bow efficiency. Will the average person notice the difference of a +/- .006 shaft from a +/- .001 shaft at 20 yards? Probably not, but why take the chance when you are bowhunting antelope or high country mule deer out west in more open terrain and further distances. This also comes with a price increase, so be sure to take that into consideration. What is the correct arrow weight? All arrow weights are measured in grains per inch (GPI). Lighter weight arrows tend to be more popular due to the impressive speed numbers that you can achieve. Lighter arrows fly faster and potentially straighter, but at the same time these fast arrows can be hard to tune and require perfect form. Heavy arrows have higher kinetic energy, momentum and are easier to get to fly straight. They are also quieter. A heavier arrow will also resist wind drift due to increased momentum (easier to alter a light object in flight than a heavier one). My current arrow setup weighs in at 440.0 grains. For me, this is a perfect combination of speed, kinetic energy and momentum. Step 1. Determine the poundage I would like to shoot. For me, this is always the max poundage the bow limbs allow. Step 2. Attempt to narrow down the arrow manufacturer by checking out website information on new products, calling manufacturers and visiting trade shows. Step 3. 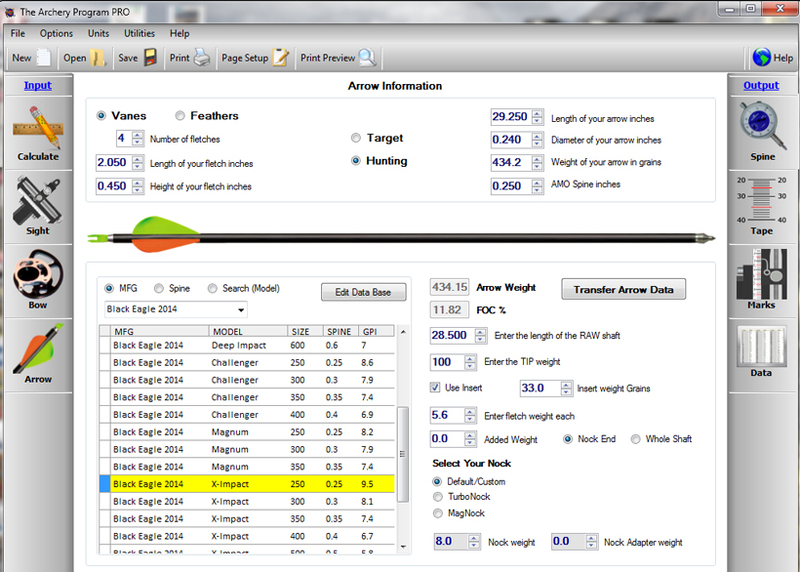 After selecting an arrow brand, determine what you are looking for in terms of arrow performance. Do you want a light and fast arrow or a heavy and hard-hitting arrow? Make your decision based on the animals you pursue — light and fast for whitetails or heavy and hard-hitting for mule deer and elk. I try to build an arrow that is slightly on the heavy side and reaches that 300-310 fps. mark. Step 4. Determine your draw length, arrow length, bow poundage and desired point weight. Use these rough numbers as a starting point when selecting your arrows. All of this can and will change once you start tuning your bow and arrows. Step 5. Enter this information into an archery software program such as The Archery Program or Archers Advantage. In my opinion this is the most important step in determining the proper spine arrow. 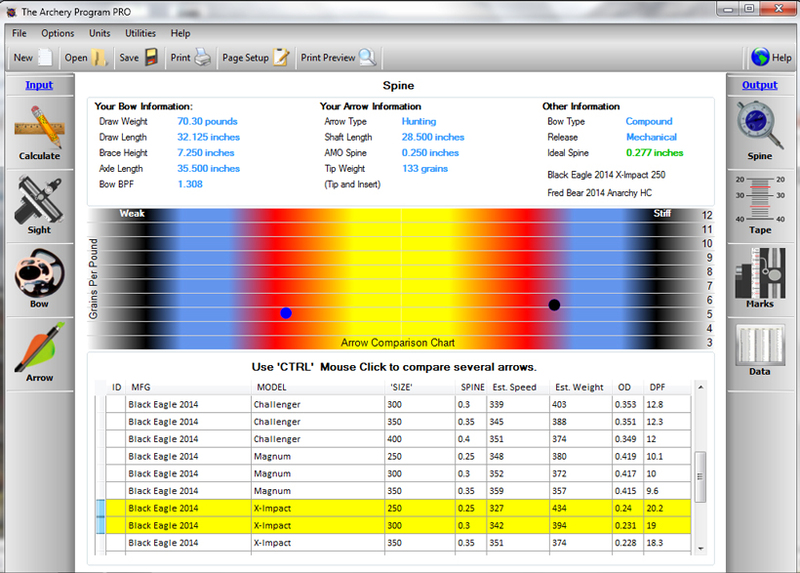 It is here where you can really fine tune your numbers — this software will tell you if your arrow is too weak or too stiff based on your draw weight, arrow length and point weight. Step 6. If you are unhappy with your results, select another arrow shaft and see how it compares. This will give you a great representation on the spine of arrow you need. In the end you need to play around with the length, arrow spine and bow speed in order to select a perfect arrow off the shelf. You can get your arrow selection close to perfect with this method and then later while tuning your bow you can further match the bow and arrow together for an setup. Awesome article. Just getting back into archery and you gave me all the information I was lookong for without talking over me. Thank you.